I know we normally only write about WOOL on this blog and that WOOL is the key focus for WOVEMBER, so you may be forgiven for wondering what on earth a post about SILK is doing here! But bear with us, dear WOVEMBERISTS, for this is a story of provenance; of trying to understand where things come from. This is the story of how I grew silk this summer, and what I learnt on the way: it belongs here, but it is a long story so you will need tea. When I started writing and researching for WOVEMBER several years ago, I was principally interested in the special provenance of WOOL: I wanted to differentiate this textile from all others and to show its origins in the landscape and the amazing people, animals and labour behind it. There is nothing like WOOL: it is still my favourite no. 1 textile and researching its production and history is as close as I will ever get to having a spiritual calling in my life: I believe in WOOL. However the richness of investigating WOOL’s origins has inevitably sparked new curiosities; the deeper I get into WOOL the more I want to know about other textiles and for that matter other materials used in daily life. To that end this year I have learnt to make beer and cheese, I have grown vegetables, and I have continued in my efforts to be more conscious of the things I use, eat and wear, and the labour and skill entailed in their production. Working on WOVEMBER has made me realise that we are divorced from many of the things we use and need, but also that for me reconnecting with those things is both possible and necessary. If you know of my work as an artist, you will know that I use sounds in ways that reflect this philosophy. I think it’s powerful to hear the wort for our beer bubbling in the garden; to listen to the sounds in the garage where our cheeses mature and to hear the sheep whose wool I am hand knitting. I use sounds to take my work on WOVEMBER forward into other aspects of life; to remake connections between people and places, objects and landscapes, to uncover the extraordinary stories of ordinary things. It was to be a large textile installation comprised largely of silk and viscose. The bespoke fabric used in the installation was woven in India at Garden Silk Mills Ltd. Since there was not enough money in the budget to enable me to travel and explore where that fabric was made, I began to think of other ways I could draw listeners into the textiles through sound. I started creating a special soundtrack connecting the fabrics in Tuttle’s work with their origins in laboratories (viscose) and silkworms (silk). You can hear what I produced here. All of this is a preamble to explain why I ended up with approximately one hundred and twenty silkworms living in my home this summer. I learnt that our beloved black mulberry tree – one we planted several years ago to mark an anniversary – would provide an acceptable food source. 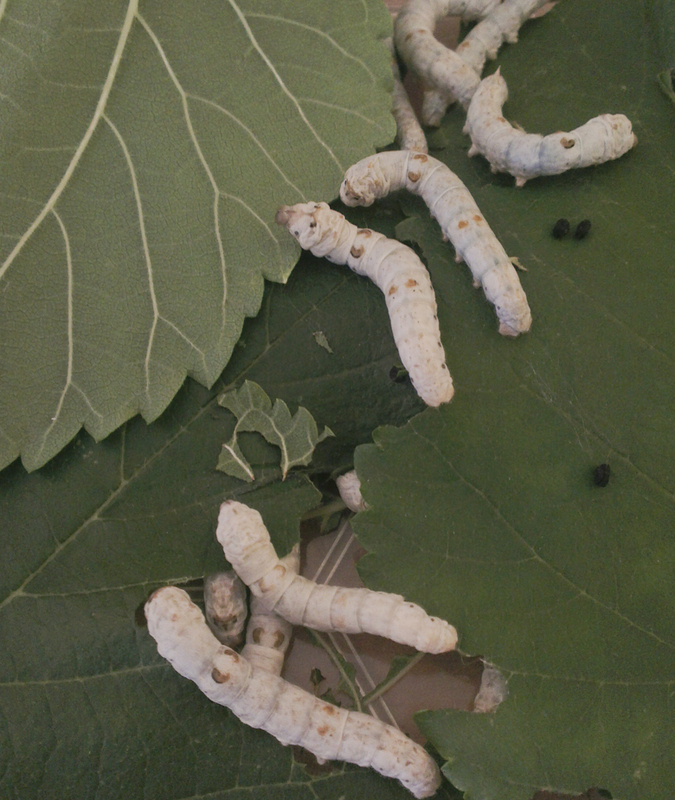 Though they prefer white mulberry leaves (they are thinner) once silkworms are a few days old and their jaws are developed, they can handle the thicker leaves of the black mulberry tree. 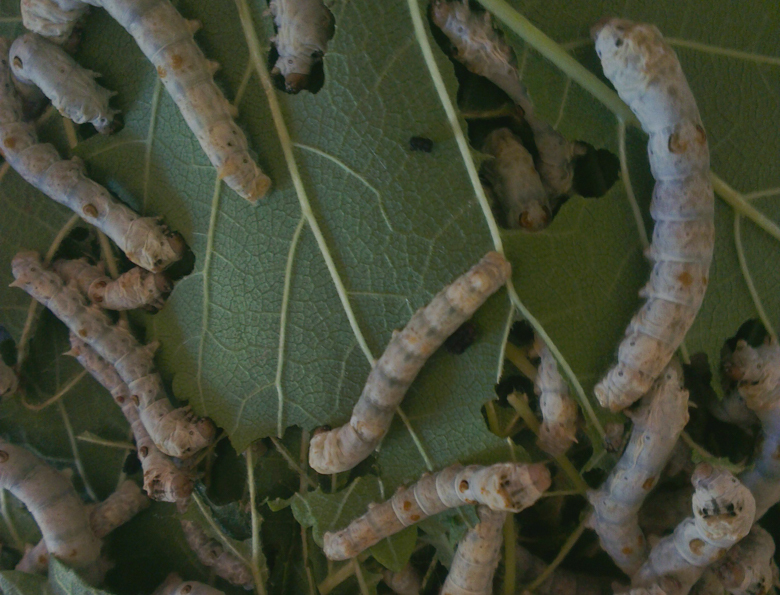 This was good; the silkworms would turn the leaves of our tree into silk! 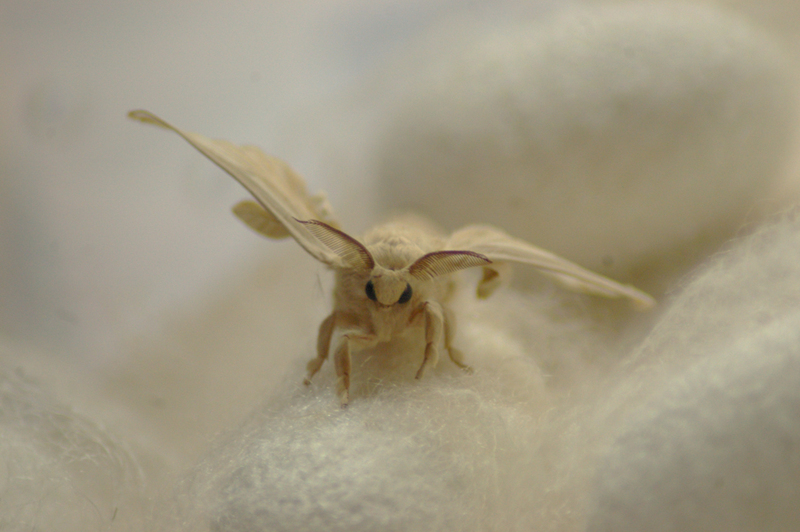 I could have pants edged with silk from my own tree, via silkworms! 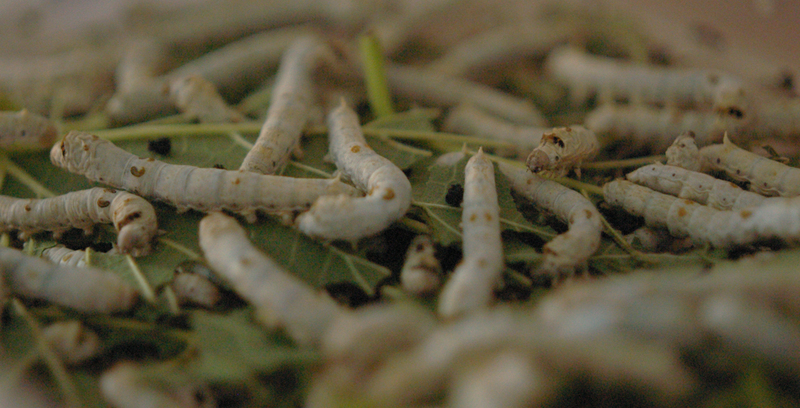 Silkworms have been domesticated for over 5,000 years with a singular focus on the quality of their cocoons. They have no innate vigour or survival instinct and exist now at this point purely to supply the demands of the global silk market or – in the case of the worms I purchased online – as food for exotic pets. 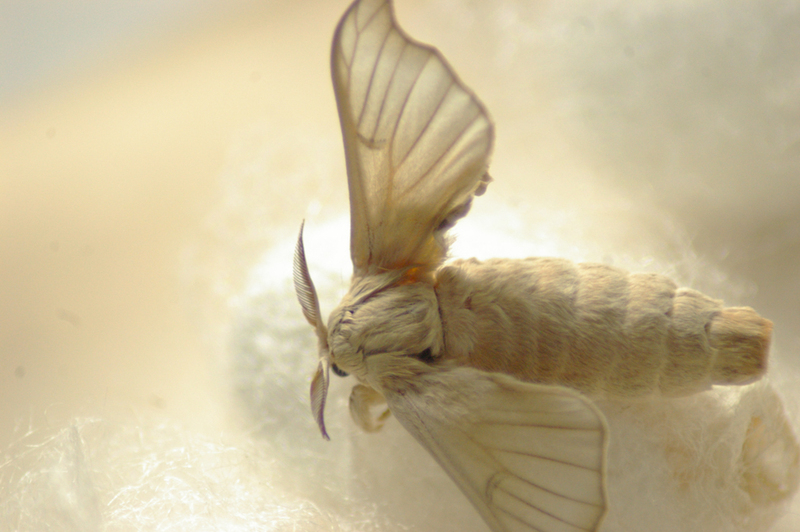 The moths that silkworms ultimately become cannot really fly; the worms can’t find food that is more than a few centimentres from their faces and they die in the face of being too warm, too hot, too dry, too wet or too hungry. They are the Goldilocks of fibre-producing beasts. 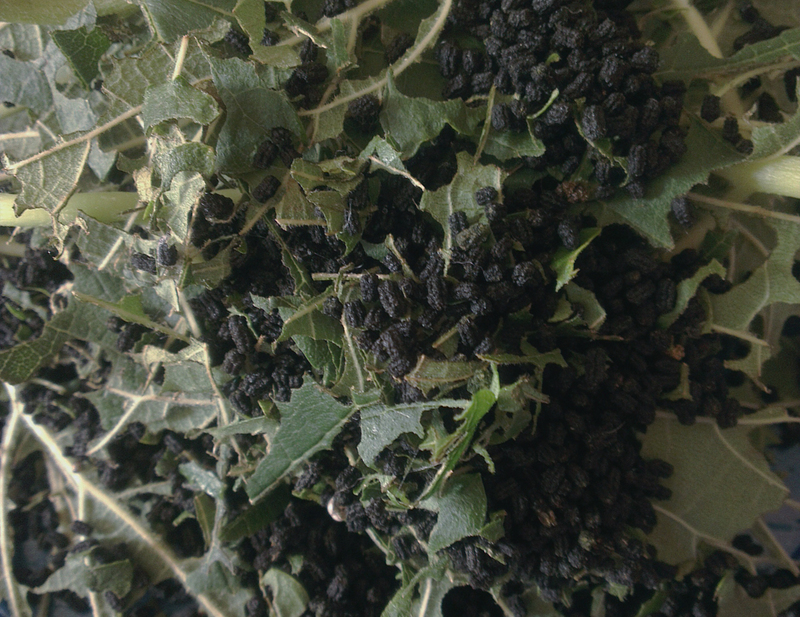 Freshly picked leaves must be washed and dried to avoid exposing the silkworms to germs, and plastic containers must be regularly bleached and cleaned to avoid any possibility for mould to build up. 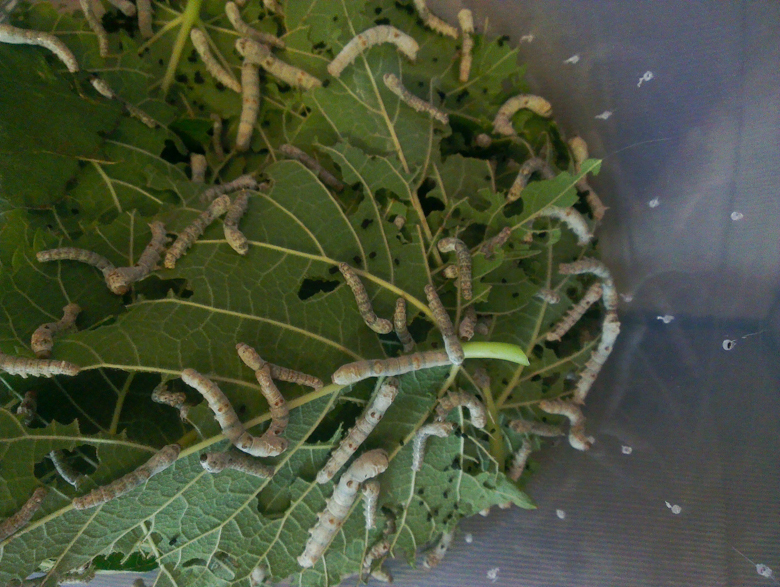 This involves lifting all the silkworms out of their container and cleaning it, then replacing the worms and topping them up with fresh leaves. This daily maintenance took about an hour an evening at the start of the adventure. I fed them several times a day and for the first week or so they munched and you could faintly hear the sound; a little bit like light rain. By the second week or so I’d realised that one container was not going to be big enough, and that one morning and evening feed was insufficient for the voracious appetites of my wormbuddies. I discovered that they shed their skins several times in stages called “instars”. You must not disturb a silkworm that is having its instar; it stands very still after attaching itself to the floor with a little silk pad. After many hours the skin splits and the silkworm walks out of it, bigger and better and extremely hungry, leaving its old skin on the bottom of the container like a discarded shoe. If you disturb a silkworm that is having its instar you can cause it to get stuck and a silkworm that gets stuck in a too-small skin is a dead silkworm. I read up on factoids like this and kept an eye on my wee charges. Picking, washing and drying their leaves and cleaning out their boxes each night, I carefully swabbed around worms that were mid-instar. As the worms grew, it started to take two hours to clean out all the boxes every night. The more the silkworms ate, the more they pooed. 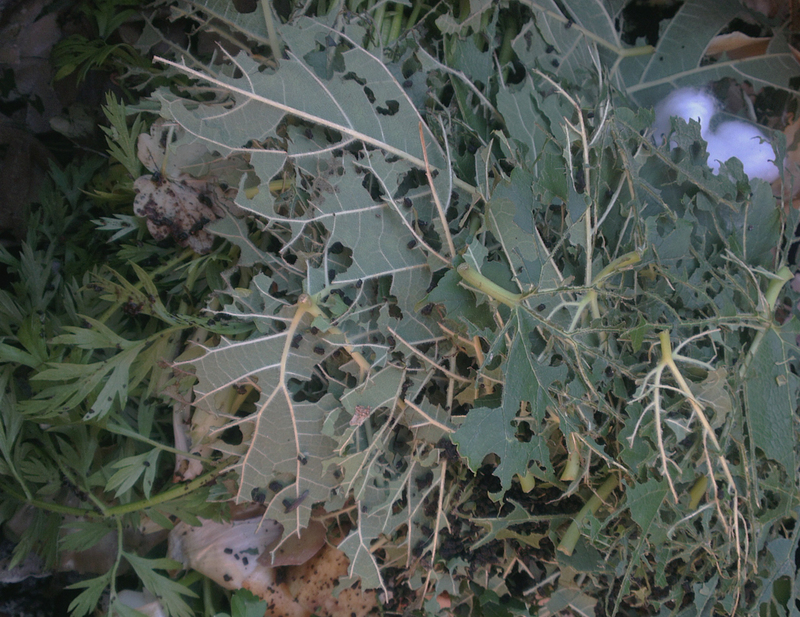 The poos got bigger in proportion to the silkworms and their meals, and I felt good about returning the neat stacks of silkworm poo – “frass” – to the compost bin where it would ultimately return to the tree that had supplied the leaves. (Our mulberry tree is right next to our compost bin). All part of the circle of life, I told myself. By the third week the worms were getting enormous; I was now feeding them five or six times throughout the day and even so would often find them standing amidst a pile of denuded leaf veins and stalks, their wee heads swaying from side to side, looking for more food. I began to fear for our tree. It’s eight feet tall and the same around, but it was starting to look a bit naked. I worried about killing the tree. I worried about the worms starving. I was by now picking, washing, drying the leaves throughout the day and spending three hours each night cleaning out their boxes. I invested in a stack of A4 size plastic crates with holes drilled in the sides; it was the only way to create sufficient space for the worms in our modest size house! 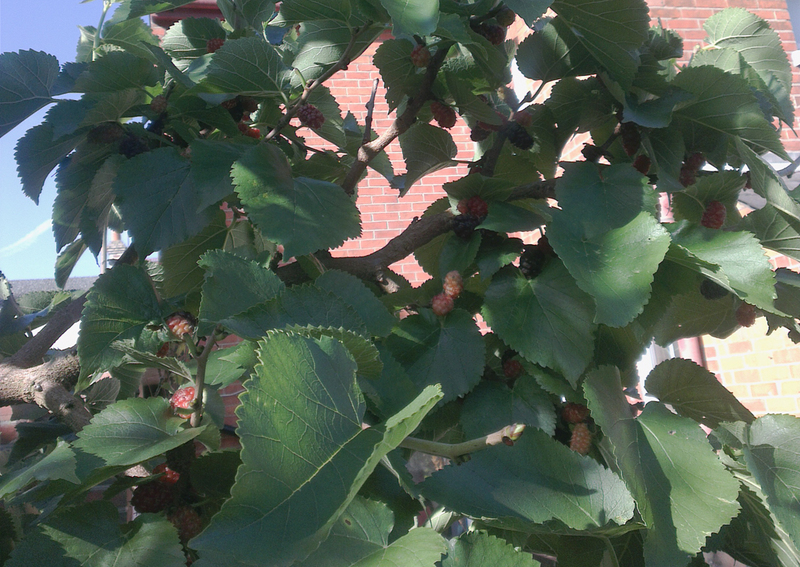 I went online: did anyone have a mulberry tree with which I could feed my worms? Luckily a nice lady a fifteen minute drive away did indeed have a huge white mulberry tree and so driving over there several times a week became another task associated with the maintenance of my colony. They grew. I ran around finding leaves for them. 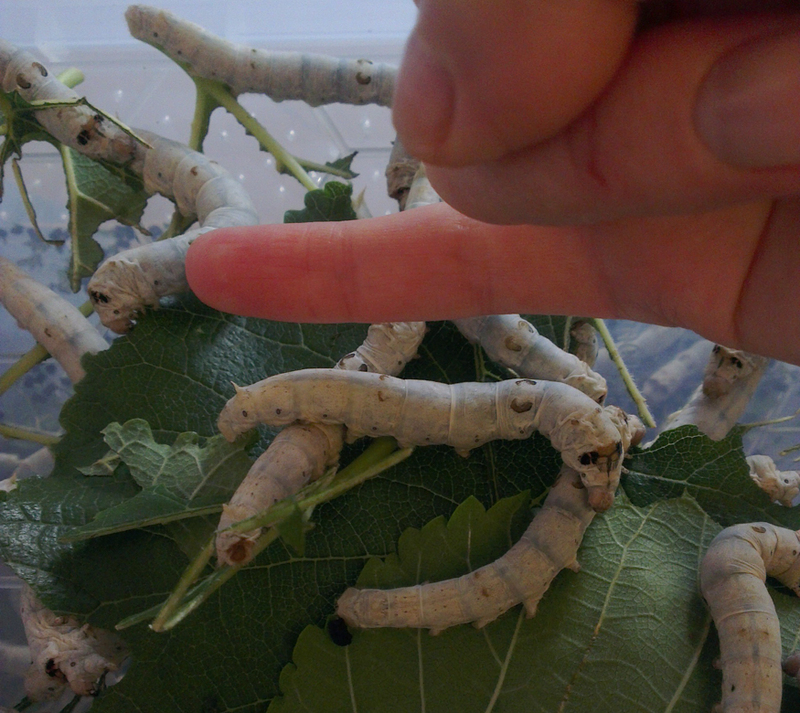 Three to four weeks old the silkworms were the size of my little finger! 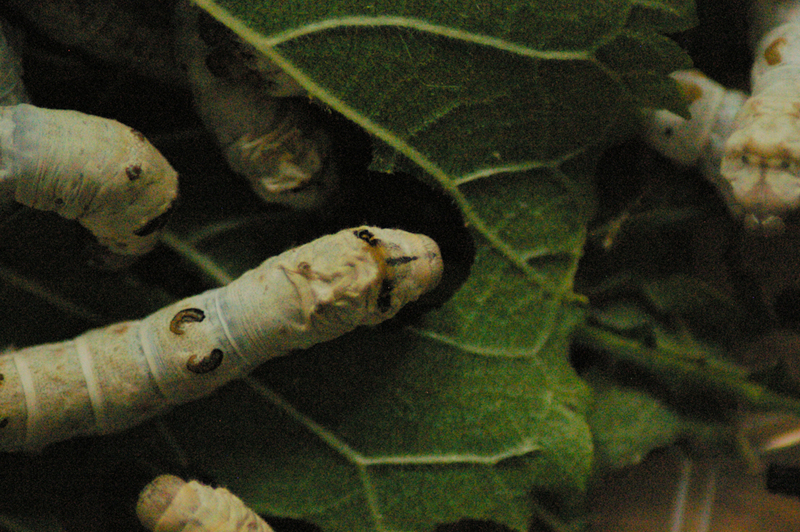 Silkworms have three pairs of true legs and then these little sucker pads called claspers which help them to grip things. If you lift up a silkworm, it will hug your finger with its claspers. They have very soft skin that is cool and extremely smooth to the touch. I will admit I was proud of these wondrous creatures onto which I had lavished so much time and effort and whose ways and habits and needs I had worked so hard to understand. I admired their delicate anatomy, their wee faces, they sweet claspers and the sounds of their munching, now more like heavy rain than light rain. They were looking large and ready enough to perhaps begin cocooning and so I optimstically arranged toilet rolls cut in half all around their boxes. 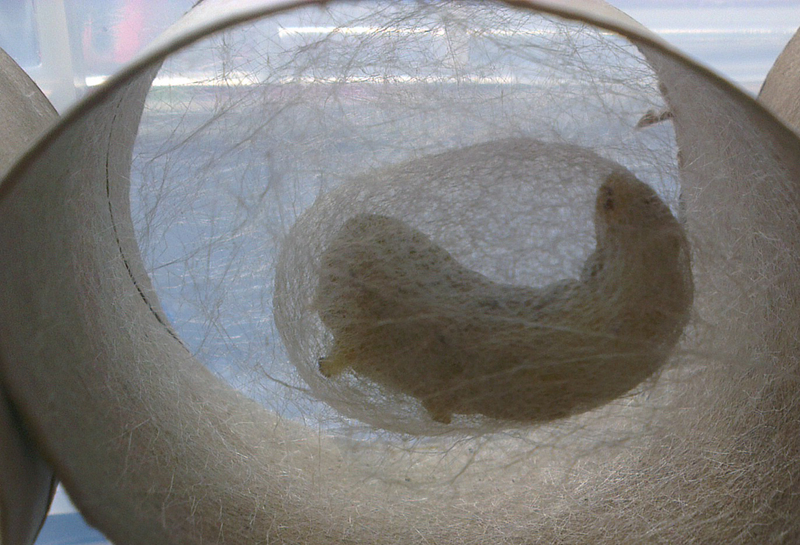 Silkworms like a little close space in which to make their cocoon, and their instinct is to go up; I wanted to get it right. 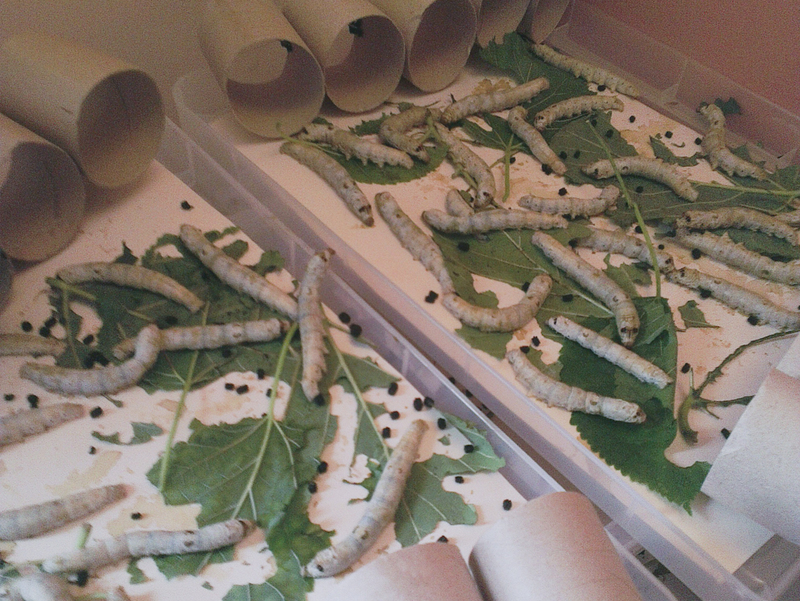 And now we get to the tricky part: what would I do with the silkworms once they had cocooned? I wanted to do as industry does and to stifle (kill) the pupae and then reel off the silk. This is how most commercially produced silk is made and silkworm pupae are eaten in many silk producing countries, so nothing is wasted. Though I wasn’t sure I could bring myself to eat the pupae, I did want to harvest the silk as it is harvested in industry – as the silk used in the Richard Tuttle exhibit was undoubtedly made – and to face the realities of how the silk I wear was made. 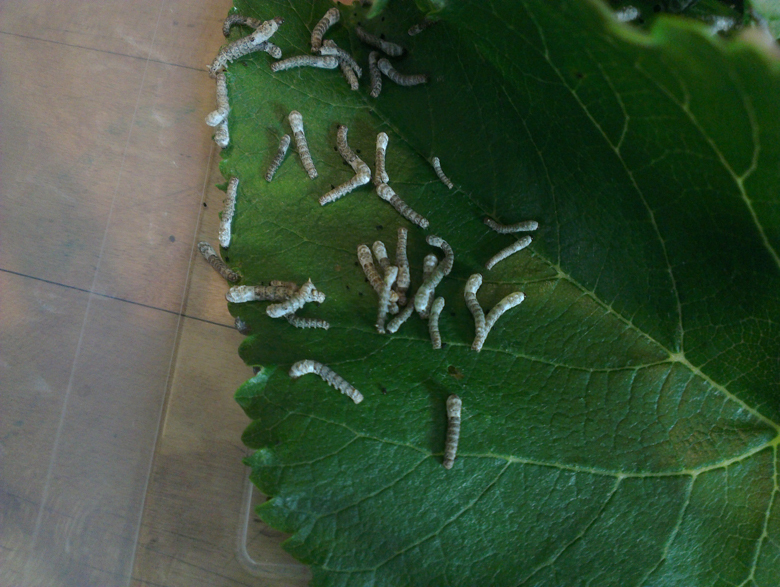 But then my silkworms got poorly. The temperature dropped ever so slightly – perhaps not even a whole degree – and they started to leak fluid, lie on their sides, and vomit a kind of yucky yellow liquid. Any feeling I had of being grossed out (and it was admittedly gross) was quickly replaced by a desire to understand and fix these symptoms; the prospect of imminent worm death was awful, and I felt an enormous loss when remembering the wholesome worms of the previous week. I felt responsible for this suffering and did not know how to make my silkworms better. I ended up actually crying quite a lot and reading everything I could find about how to restore health to the colony. I was sad every time I had to put worms into the compost bin. I got a sense for the difference between a worm that has truly given up the ghost and one that is still fighting to live. I did everything I could to save the healthy ones, and the poorly ones had to be separated out to try and stave off mass infection throughout the colony. 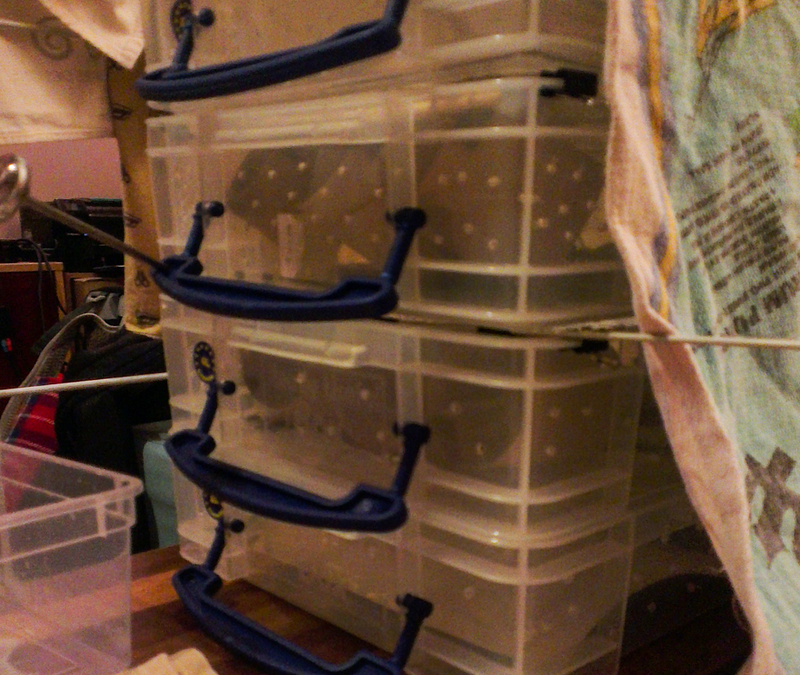 I separated the leisureplex into four storeys: well worms, well-ish worms, sick-bay and hospice. The worms were organised according to their likelihood to survive and I tended them around the clock. Evenings became a vigil; I was now spending four hours a night cleaning the boxes out and checking the silkworms over and ensuring that they had the best circumstances for recovery. Meanwhile, I was working hard on my book. It was all a bit much; the project was way more work and heartache than I’d imagined. By this stage I had recorded all the sounds I needed for the TATE Modern project, but I was committed. four-storey silkworm leisureplex: well worms, well-ish worms, sick bay and hospice. Then I was supposed to go away for a weekend. My plan was to drive to Milton Keynes on Friday night, drive home Saturday morning, tend worms, return to Milton Keynes, return home on the evening, tend worms etc. This scheme would have involved around twelve hours of driving over the course of one weekend and even then I was sure many worms would die from neglect. I considered cancelling my trip but then Nic – the extraordinary Art & Production manager for the KNITSONIK Stranded Colourwork Sourcebook – went above and beyond and agreed to worm-sit for me. Her and her husband Russell took in my comrades and Russell – on finding a science paper on the subject – applied the worms to lots of wonderful heat treatment. At the end of the weekend, though some worms had spiraled off this mortal coil, many had returned to the full bloom of health. To say I was grateful is an epic understatement! The worms were well! I took them home and set them up with a heater to continue blasting them with warmth, and then watched in wonder as they began to cocoon. 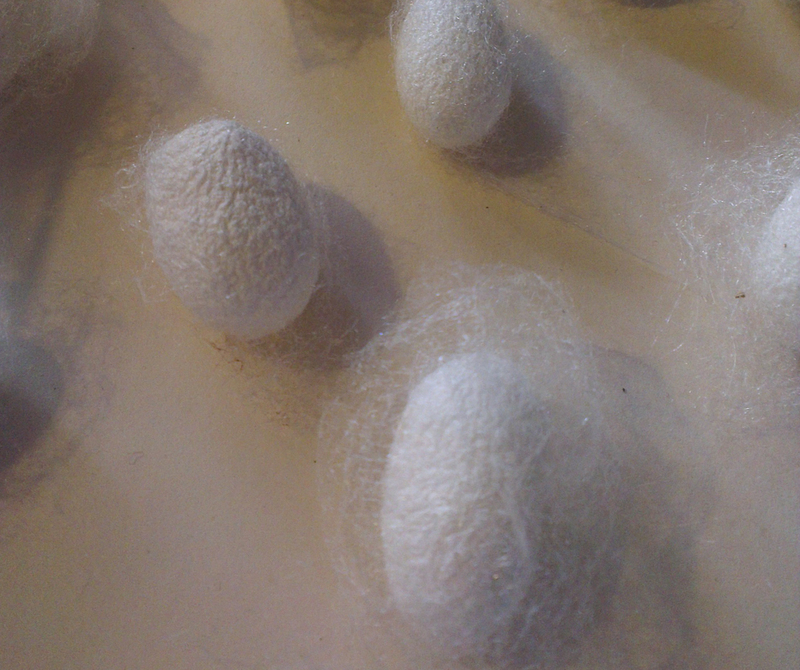 After about a week most of the silkworms had made cocoons though several more had died. 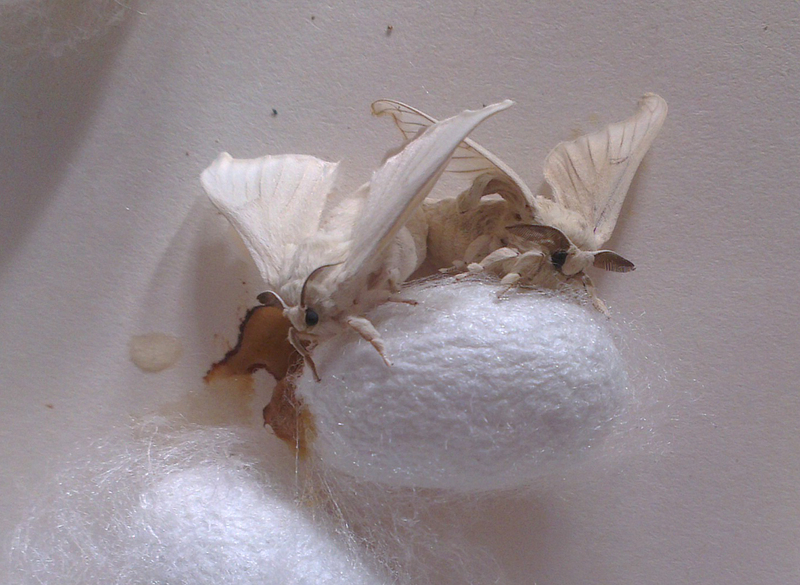 After about a fortnight, I met my first silkmoths. The first one to hatch was a male who waited patiently until a female moth turned up; then he buzzed around excitedly and they spent a couple of days hanging out like this. She covered the plastic box with eggs and then a second female moth hatched and the same thing happened. Then all three moths died. None of the other sixty or so cocoons hatched; I don’t know why. I have frozen them and when I feel ready, I will reel off the silk and then ply it with some soft wool to make a 2-ply laceweight yarn with which to knit lace edgings for pants and vests. I will have lingerie from my mulberry tree – via silkworms – and, in the meantime, the sounds of my small worm buddies have been immortalised for TATE Modern and will hopefully be heard by many people who have not yet made the connections between the churning jaws of the silkworm and luxury silk textiles. Silk will never seem the same to me after undertaking this project; I have enjoyed joining the dots between the insects from which silk comes and the finished cloth, and it has given me a deeper appreciation for why it is expensive. It seems to me to be an amazing luxury substance entailing vast costs in animal life, human labour and mulberry leaves. The plantations of mulberry trees grown commercially for silk production must be enormous and the hours involved in tending to huge colonies must be eye-wateringly long when I think of the hours I poured into looking after my comparatively tiny colony of one hundred and twenty silkworms. Watching the silkworm buddies grow, eat, poop, pupate gave me conflicted feelings about what it means to domesticate animals and to be responsible for them. I loved it when it was going well, but the sense of culpability when it was not was horrible. 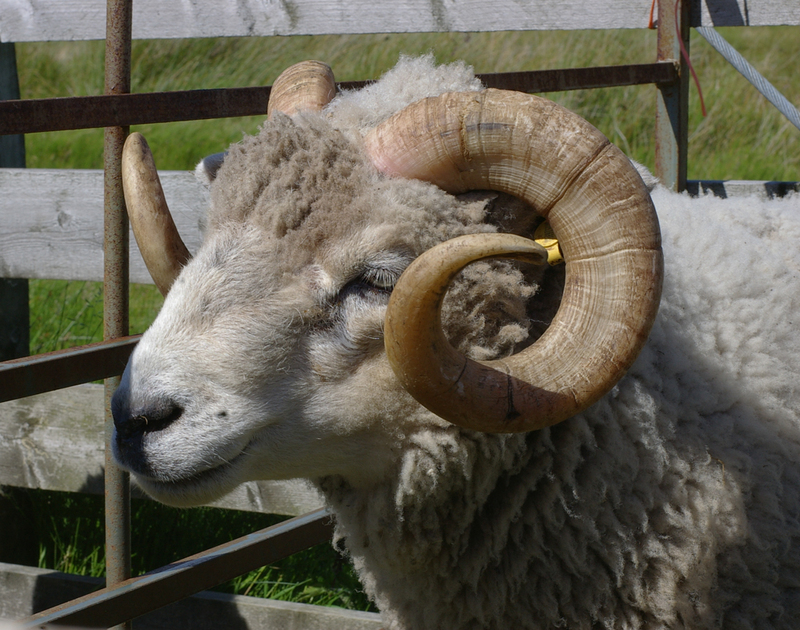 This brings me back to the preferred subject of this blog: WOOL. Ultimately growing silk gave me a renewed appreciation for WOOL. I felt a deep affinity with my silkworms and their tiny dependent bodies, and – through these experiences – can only begin to imagine what it must be like to be reponsible for an animal into whose eyes you can properly look – like a SHEEP. And in my sentimental decision not to stifle the cocoons, I feel I gained the very slightest insight into what it is like to save a lamb when all good farming sense says it should go for slaughter. I know a silkworm and a sheep are miles – species – apart and I genuinely hope nobody will take offence at my attempts to draw parallels: I’m not saying that growing silk and growing wool are the same thing at all! But having animals in one’s care and of growing them for our own ends are related. The sense of work involving a lot of poo, daily feeds and complex resource management are related. Wishing to understand the provenance of textiles is related to both the keeping of the silkworms and the keeping of sheep. 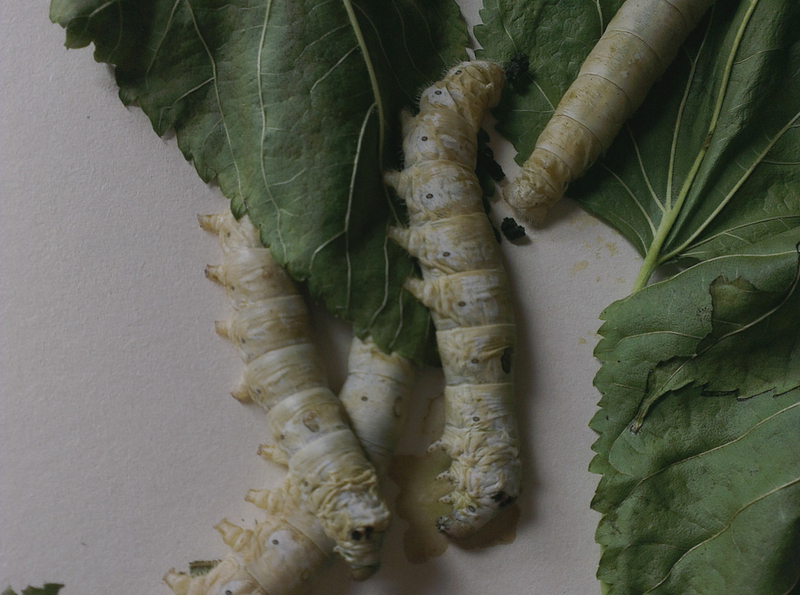 The silkworms were a feasible project for me to get a taste of what it means to grow my own fibre at home… it is all part of understanding what is involved. I don’t think I would have approached my commission for TATE Modern in the way I did had it not been for WOVEMBER; writing and researching here for the last few years about where WOOL has come has fed my curiosity for the provenance of all things. I am full of awe for fibre producers everywhere; it is sobering to investigate where things come from and I think that getting my hands dirty is an inevitable and amazing part of that process. RIP turbo silk buddies, RIP. You were awesome.